Protesters with One Pittsburgh rally outside the BNY Mellon building in downtown Pittsburgh Friday. After about half an hour, BNY security escorted group members out of the building, at which point the rally continued outside. Kramer said Head Start is a vital program for children. “If anything, we should be expanding (Head Start)," she said. "We shouldn’t be cutting that program. It’s a program that works not just for those families, but also it’s an investment in our future." 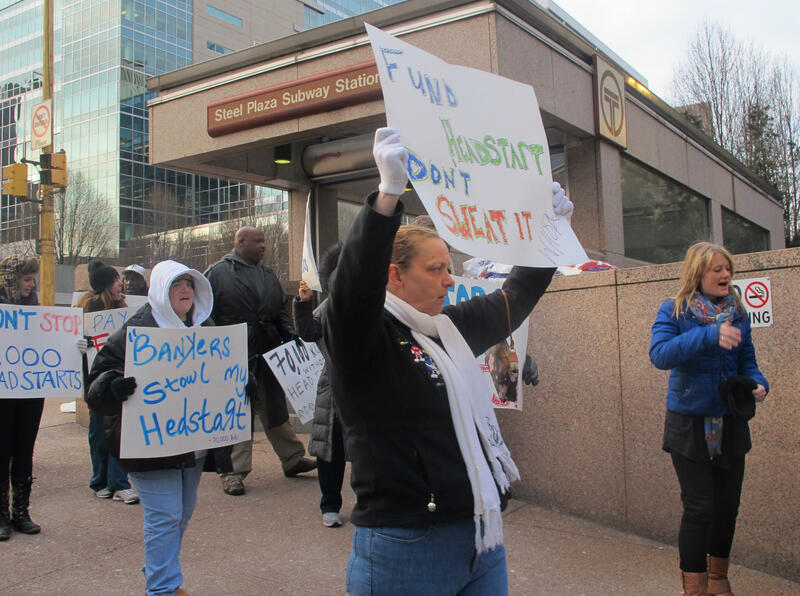 One Pittsburgh chose BNY as their protest location because BNY CEO Gerald Hassell is part of the Fix The Debt campaign, a "non-partisan movement to put America on a better fiscal and economic path." One Pittsburgh feels the Fix The Debt campaign wants to address the nation's debt crisis by eliminating programs for the poor rather than fixing tax loopholes that would cost businesses more money. There have been multiple studies done on the effectiveness of Head Start, including one in 2007 that stated the program passes a cost-benefit analysis. However a 2010 report by the Department of Health and Human Services found there was little impact for children who participated in Head Start past the kindergarten level. Hannah Williams, who attended the rally Friday, has a 3-year-old daughter who would be going into Head Start this year. Without the program, she feels her daughter will be at a disadvantage.